A Prezi colleague recently asked about my most awkward onstage presentation experience. When I told her, she insisted I post it. Memphis TN, 1976. It’s a hot summer day at Libertyland, Memphis’s ironically named theme park. Some friends and I swelter in packed concert tent waiting to see Rick Dees. God knows why. Another friend who works for Rick (as the Dis-Gorilla) finds me in the crowd and tells me the Disco Duck called in sick. Desperate, he asks me to fill in. I’m 15 — a shy, nerdy kid who avoids any limelight. I decline. My friends heckle me into accepting. The stage is massive, the audience in the thousands. My friend rushes me backstage and, with some concert roadies, zips me into an enormous, suffocating duck suit. It’s August, well into the 90s. I sweat profusely as I rehearse the duet I’m about to fake sing with Rick. The exaggerated quack-nod is hard to master because any movement of my gargantuan duck head causes my glasses to slide down my sweaty nose. I can’t adjust them because I don’t have hands, only big furry wings. I tilt my head back to balance the glasses on the bridge of my nose to stop them from slipping further (and to see—I’m legally blind). It’s time. My pulse throbs in my ears. As I part the heavy curtain to walk on stage, I become paralyzed. Sweat and a bad lens angle blur my vision as I peer out from my beak into sea of expectant faces. I feel sick. Either friend or roadie pushes through the curtain. The audience roars in expectation. I waddle over the wire-covered floor to my microphone. The music starts. Miraculously, I lean in to the microphone on cue for my lyrical quacks and rhythmic nods. The first quack dislodges my glasses. My anxiety shifts from the crowd to my glasses. With every quack-nod they slide farther down my nose and I tilt my head farther back to compensate. Suddenly, the music stops. My glasses rest on the tip of my nose. I made it. As the applause wanes I realize I have no idea what to do next. No one told me how to get off the stage. My head is titled so far back all I see are the stage lights overhead. I think Rick has already gone, but I’m not sure. I hear a loud groan and turn toward it. Something slams into me. My glasses go flying out my beak as I’m knocked to the ground. The audience thunders with laughter as I roll over and blindly crawl across the mesh of speaker wires to the curtain opening, where the now-suited Dis-Gorilla grabs me by the wings and drags me through it. A half-hour later, de-costumed and deflated, I sit alone backstage and wait for a break in the show to retrieve my glasses. I finally muster the courage to ask the roadies when happened. The fact that I don’t know triggers a long bout of uncontrollable laughter. Apparently, after my song was over, the main entertainment of the evening, Lou Ferrigno (aka, the Hulk), appeared on stage in full regalia. I just stood there in my giant duck costume towering over him. So he rushed at me to scare me off stage. When I turned toward him with my head titled back, it appeared that I was challenging him. He had no other option but to tackle me. I’ve had many presentation snafus since, but I have never again been rendered prone and blind by a faux superhero. 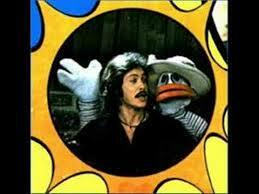 PS The song Disco Duck was a #1 Billboard hit in 1976 and even made the top 100 songs that year. Unfortunately, I do not have a video of my performance (what I would give …), but if you’ve never heard the song and feel like writhing in pain, here you go. PPS Dis-Gorilla was a follow-up flop. This entry was posted in Personal Essay, Presentation, Prezi and tagged Disco Duck, Memphis, Prezi, Rick Dees. Bookmark the permalink. That is one of the top five stories of all time.